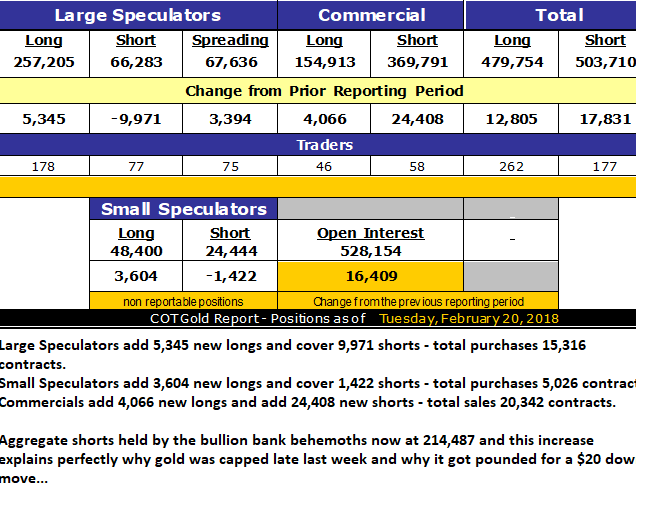 Dovetailing perfectly with my last missive entitled “Shenanigans”, this week's COT report covers the period of February 13- 20th and is a classic example of price capping by the bullion banks. It ended on the day after President’s Day with stocks coming off a nerve-rattling week and trying desperately to find their footing. It is no coincidence that we saw a massive and coordinated effort (as always) to defend “RISKY ASSETS” (stocks) by the Interventionalists. That gold’s advance through the $1,360-1,370 level was rejected at the precise point that stocks bottomed is anything vaguely related to correlations. It is related to interventions and debunks any notion that the traders that take their orders from the Fed or the U.S. Treasury are still under contract. 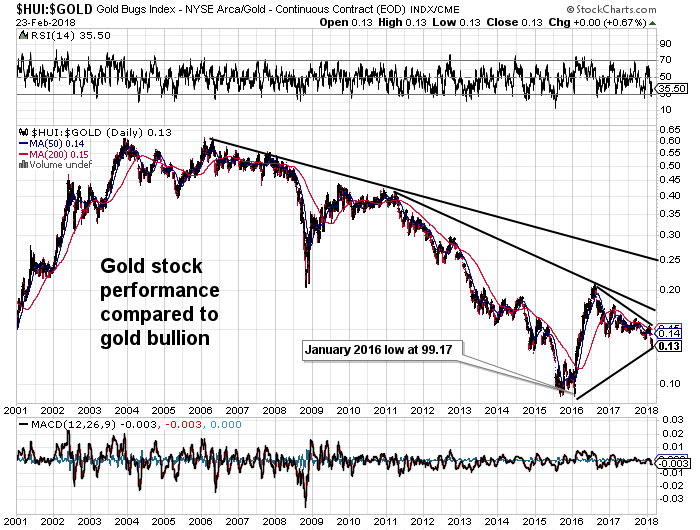 However, as maddening as it may be, the trend remains very positive for gold and were it not for the dreadful performance of silver and my beloved Gold Miners, I would be feeling quite confident in ownership of the space. As just mentioned, all is not exactly well in the world of precious metals because I am getting two glaring non-confirmations that have historically weighed heavily on future prices. 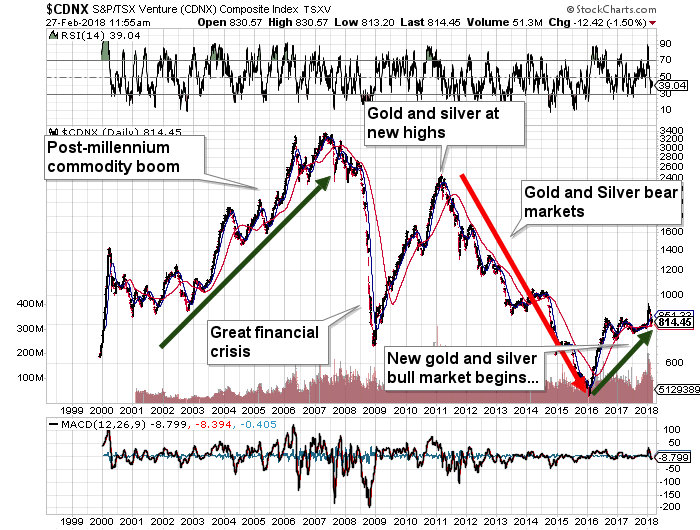 The first is silver which has been arguably the worst investment of the past seven years. 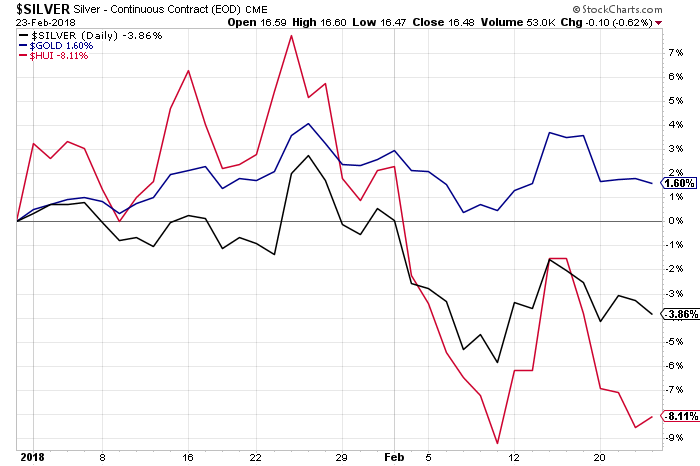 Not only is it down 3.6% YTD, it is underperforming gold so poorly that the silver-to-gold ratio now resides north of 80. For it to take over 80 ounces of silver to buy 1 ounce of gold takes me all the way back to 2002 and based on the voluminous reports of silver’s “solid fundamentals”, the price action argues against that being true. I don’t deny that simply based upon price comparisons with other metals like copper, silver appears to by undervalued; the problem today is that the MARKET tells us that it is OVERVALUED. Interventions and manipulations aside, you can’t reverse a long position that goes the wrong way because a bullion bank leans on the price. We all learned that the hard way in April 2013. 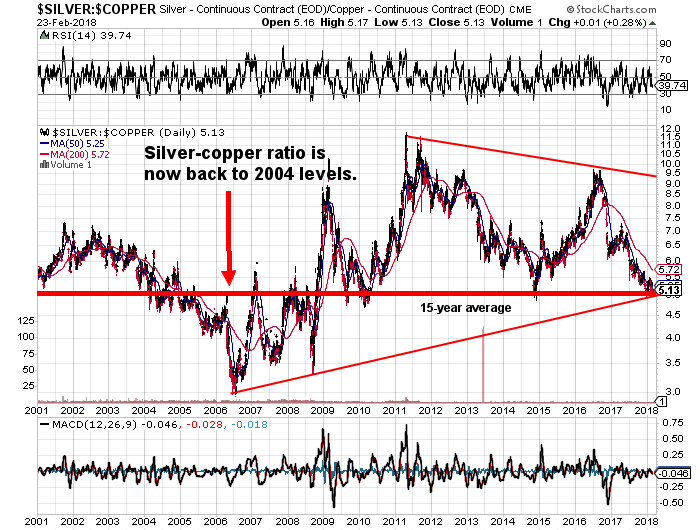 The historical positive correlation between copper and silver has recently been rejected as silver now resides at 2004 levels when valued against copper. If you are bullish on copper and zinc as a proxy for the “reflation trade”, you have to be mindful of the role that the big bullion banks such as JPM play. JPM won’t dare meddle in the massive, liquid, globally-diverse copper market because their shenanigans would be an invitation to disaster. However, the highly-illiquid silver market is an easy mark for the bullion bank traders and they have it on a well-controlled rope and have done so since 2000. Silver-to-gold and silver-to-copper ratios are nearing historical lows their weakness remains a drag on sentiment and a technical flaw in the gold bull’s argument. Even more glaring is the pathetic performance of the $HUI (Gold Producers Index), down over 8% YTD with the GDX ETF having lost over 40% of inflows since 2016. Whether or not people are simply dumping miners for those sectors trending higher such as the FANGs or weed or blockchain, this is the cheapest that we have seen the HUI relative to gold bullion in ages with the HUI:GOLD ratio at .13. This puts gold share performance at roughly one-half of the peak achieved off the January 2016 HUI low at 99.17. The junior exploration and junior development issues of the TSXV and CSE are both my passion (and my major investment in terms of time and of dollars). They are completely slave to the movements of underlying commodities and have been since I first got hooked after the Hemlo gold discovery of 1981. The late ‘70’s saw massive gains in the juniors all driven by gold, silver, and oil price gains which were in turn driven by the Stagflation of that period. The period of 1980-2000 was dominated by a disinflationary bias that arrived with productivity gains from technology and emerging markets labour accessibility. Gold and silver prices languished in that era as stock prices enjoyed a massive bull market with particular attention to the NASDAQ tech. However, it was during this major disinflationary period that some of the biggest mining and oil discoveries were made and investors were rewarded with immense capital gains in issues such as Consolidated Stikine Resources (Eskay Creek), Diamet (Ekati), Diamondfields (Voisey’s Bay), and Arequipa (Pierina) where 2,000-10,000 percent gains were made. Mountain Province Mining, an issue which I owned in the 1990’s from $.40 peaked at $9.75 in 1996 after the 5034 diamond discovery was announced. However, here in 2018, the biggest discovery with which I have been associated has been the 2011 Ayawilca discovery by Tinka Resources which now resides at 42mt of 7.7% zinc-equiv. To give you an example of the difference in investor expectations, Ayawilca averages about 5% Zn (ignore the other credits for now) so at $1.60/lb. Zn, the in ground metal value is north of $7.4 billion U.S.. so for its 100% interest, TK trades at a market cap of $132 million. In 1996, Mountain Province had 18 million carats at $80/ct fir a $1.4 billion in situ ore value. At its peak Mountain Province traded at a $300 million market cap or 21% of in situ metal value. Tinka today trades at around 1.8% of in ground metal value underscoring the incredible difference in prices paid for discoveries since the 1990’s. Another example is Diamondfield’s Voisey’s Bay discovery where a 141m tonnes of 1.6% nickel worth $29 billion was taken over for $4.6 billion 15.8% of in situ metal value. My point is this: either these junior developers are ridiculously cheap today or they were substantially overpriced twenty-five years ago. Obviously, with the number of new discoveries in serious decline and with demand for raw materials increasing, new discoveries should be valued at least on a par with the 1990’s and, given the diminished value of money, valued more generously than in prior eras. As to the explorers, retail investors have been bludgeoned so badly since 2011 that interest levels from that group has waned to levels not seen since after the 1997 Bre-X fraud was revealed sending investors to the junior explorco sidelines for some five agonizing years. 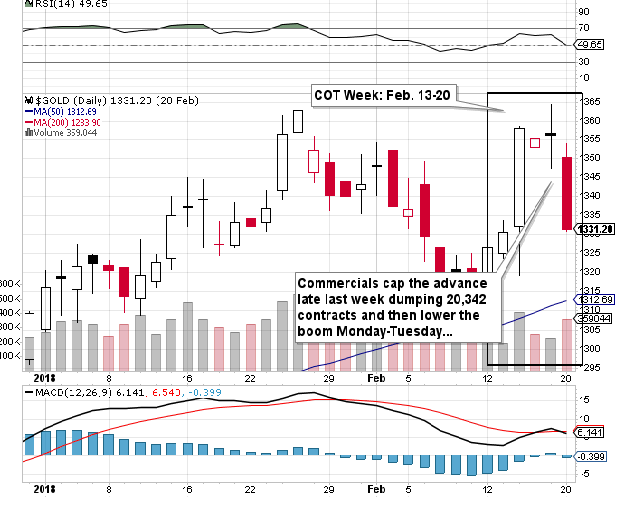 True upside breakouts in gold (above $1375) and silver (above $17.50) unimpeded by Commercial Trader shenanigans. The conditions listed above, once in place, will set up the kind of junior exploration environment that includes broader participation and improved liquidity so necessary for sustainable advances to occur. From the 20-year chart of the TSX Venture Exchange shown below, the glaring degree of underperformance of the TSX Venture Exchange from 2007- 2009 was a function of the subprime meltdown but the more damaging period was 2011-2015 when the bear market really unleashed its ferocity. As I have written countless times over the past few years, the TSXV would have to quadruple just to get back to 2007 levels and therein lies the opportunity. There are many well-positioned juniors led by very competent management teams that are in the hunt for the next large-scale discovery and while it always takes longer than one might expect, when the two Goddesses of mineral exploration, Mother Nature and Lady Luck, grant their blessings, the resultant rewards can be staggering. Keeping one’s spirits buoyant while holding junior exploration and development issues has been a difficult task but remember that the most important part of any investment is one’s entry point. If one assumes as I do that a return to 90’s-style valuations is in the cards, then accumulating a basket of these penny dreadfuls will be a rewarding enterprise. I have always liked the exploration sector because they can move from sub-$5m to supra-$200m on one drill core intercept unlike developers that take a great deal more time and money to make similar valuation advances.